Take your promotions for a test drive. Your brand deserves market-tested, data-driven campaigns — not just your best guess. Learn what engages, entices, and excites your audience with small, continuous updates using our A/B testing tool. Test everything from the font to imagery to call-to-action color. In order to optimize your conversion rates, you must first optimize your messaging — one small test at a time. Different plans for different shoppers. What works for one audience segment, won’t always work for others. 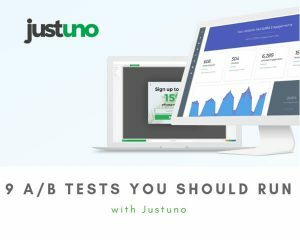 Justuno’s A/B testing helps you understand the customer experience and find the perfect combination for every audience. Your website traffic volume is only as valuable as the quality. Compare your promotion performance to industry standards and make sure your promotions are unlocking real opportunities. A/B Testing is the cornerstone of advanced marketing. Brands today need to test variations to maximize effectiveness and optimize growth. As marketing continues to move toward AI-powered decisions and quantitatively determined success, it’s crucial that brands stop relying on gut feelings and start backing every decision with data. You’ll never know how much money is being left on the table without utilizing A/B testing tools to optimize your promotions and site experience. 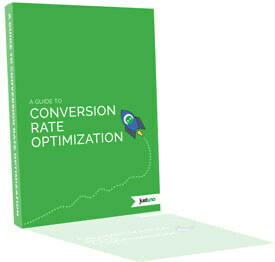 Find out what copy on your CTA’s compels more of your customers to convert with continuous A/B testing. Without testing, you’ll never know that CTA’s that say ‘buy now’ converts 28% more shoppers than ‘add to cart.’ Make sure you know your customers as well as you think you do and test out every assumption. One jewelry company found 37% more conversions using a lifestyle image vs. plain color promotion background. A design studio with intuitive features to bring your brand to life through elegant and manicured promotions. Data doesn’t stop with A/B testing. 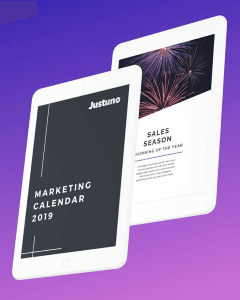 It’s built into the core of Justuno and runs through every product we offer. Explore more of our data-backed products below. Become an A/B testing expert and implement best practices, tips, and trends from our related resources.